This is a "cross-eyed stereogram" of a 3D Mandelbrot set fractal. To view it, sit at a comfortable distance from your monitor and look at the dividing line between the images. Then hold your finger about halfway between your eyes and the screen so it appears just at the bottom of the image. Then look at your finger and slowly move it closer to your nose. This will cause you to cross your eyes. As your finger gets closer to your eyes, the left and right images will cross over and at some point you should see a stereoscopic view in your field of vision between the two images on the screen. It takes a little practice. Once you are able to see the stereo image, you should be able to hold your eyes in position and remove your finger. 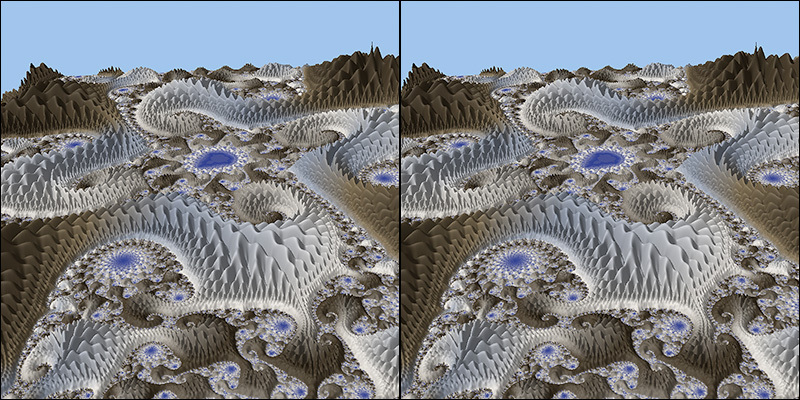 The image was generated with FractalWorks, a free high performance fractal rendering program for Macintosh computers.